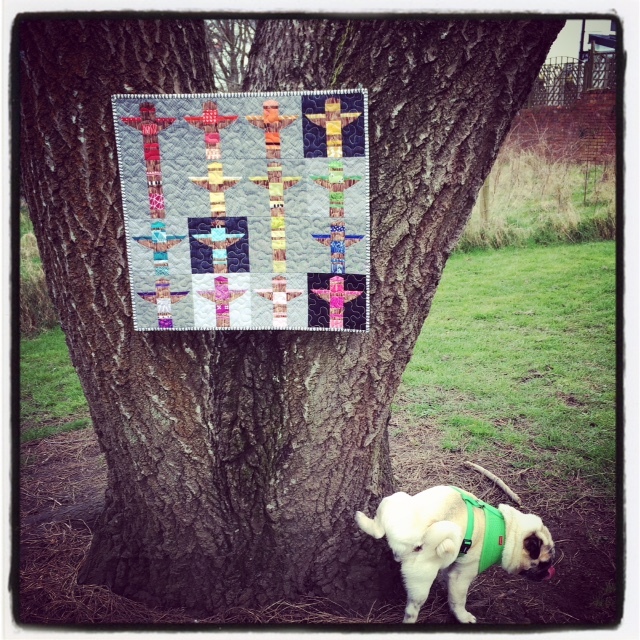 Quilt swaps are a great way to become engaged with the online quilting community. You make friends, learn a thing or two and, at the end of it, come away with a lovingly, hand-made quilt. 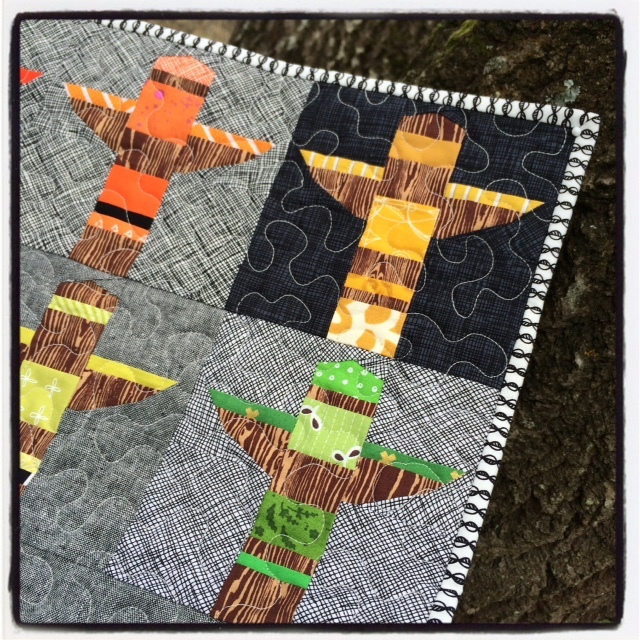 You may remember I participated in a second Schnitzel and Boo swap and the Instagram Mini Quilt Swap last year. This year I’ve signed up to three swaps, with the first being the Rainbow Mini Swap, organised by Kate Basti through Instagram. 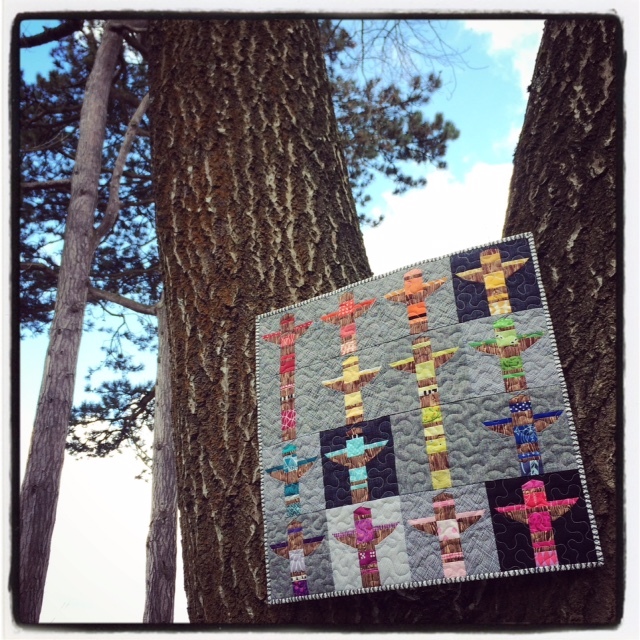 If the hashtags for these swap (#rainbowminiswap and #rainbowteamred, green, blue, yellow and for the individual groups) are anything to go by, nothing is more inspiring than a rainbow of fabric made into a quilt. There are some really amazing quilts to be seen, each unique and beautiful to look at. Despite the swap name, the minis didn’t have to feature a rainbow of colour but rather take inspiration from it. I began the process with a quick sketch. For whatever subliminal reason, I had the image of a totem pole in my head. I imagined bands of colours across a Joel Dewberry wood grain fabric that I had buried in the stash. In the end, it turned out to be not quite enough, so I luckily sourced some more from Simply Solids. I made some more sketches before deciding upon a design which I turned into a paper pieced pattern. I decided that would be the best way to make the blocks. With the pattern good to go I began construction. I wanted to arrange the blocks in colour wheel order, so began with red and ended with pink-red. I can honestly say that choosing the fabrics was the best part of making this quilt. I had 16 coloured piles of scraps that would form the bands of the totem poles. The background would be a mixture of crosshatch, Essex yarn dyed linen and solids to give a scrappy looks. For the colours I went straight to my favourites; Tula pink, Alison Glass and Carolyn Friedlander, all mixed with an array of Kona solids. I also included some hand-printed fabrics by the talented Karen Lewis of Karen Lewis Textiles. I’ve long admired Karen’s work on Instagram and this was the first time I’d gotten my hands on some of her screen printed cotton. Her designs are perfect for this sort of project, even in small pieces, and I knew I wanted to include some from the project’s earliest conception. The quilting stumped me for a long while on this one. I still didn’t have an idea when I was sat at the machine with the basted quilt on my lap! In the end I just placed the quilt sandwich under the foot and went for it, ending up with and all over meander which I think brings all the piecing together. I chose a light cream thread so’s not to distract from the colours of the blocks. The binding was simple; a small-scale black and white print from my LQS. This one was a hard one to give away, but I have the pattern at least so I can always make another. Paper piecing is something I enjoy and I love the challenge of designing my own patterns. Before I sign off, I have to share this picture of Samuel’s reaction to the quilt. I already posted this on Instagram but what the hell, it’s funny! Thanks for visiting! I was fascinated with these totems from the first IG glimpse. They are winderful! It turned out great. Your work is beautiful as always. You make it sound so easy!